Standing at the edge of the pool deck next to his fellow Canadian teammates of the national water polo team, Dusan Lazarevic stood by as the announcer first announced the Serbian national water polo team. The mostly Serbian crowd went wild as each athlete stepped forward and put his hand up when his name was called. Then the announcer switched sheets and started to announce the Canadian team. A silence fell over the crowd. Then the announcer called out Dusan Lazarevic. Many in the crowd stood and cheered for the Serbian playing for the Canadian national team, as he was still a fellow countryman. "It was awkward," Lazarevic said. "I was representing one team and at the moment I did not think that I was." The idea of foreign athletes playing for another nation's sports teams is not a new concept. During the first Olympic Games in Greece around 500 B.C.E., champion athletes were honoured with statues erected in their likeness, various gifts and honors, including exemption from taxation. But in the later Olympics, winning these awards corrupted the original purpose of the Games. Proud amateur athletes were challenged by foreign athletes who were granted citizenship to compete and were paid handsomely by Greek gamblers. Prior to the return of the Olympics to Greece in 2004, Turkey offered 10 million U.S. dollars to Hossein Rezazadeh, one of the strongest men in the world, to change his nationality and become a member of Turkey's national weight-lifting team. Although Rezazadeh rejected the deal, saying in a press conference "I am an Iranian and love my country and people", the idea of buying Olympic medals, which started over two millennia ago, has not gone away. "Is money going to be the motivating factor to swear allegiance to another flag?" asked Carl Georgevski, a Macedonian who moved to Canada and became the Canadian Olympic track and field coach at the 1988, 1992 and 2000 Olympic Games and currently the head coach of the University of Toronto's track and field team. "Everything an athlete is today is because of where an athlete lives and the opportunities the nation has provided to him or her." Bruce Kidd, a former Canadian Olympic athlete of track and field and now the dean of athletics at the University of Toronto, said he condemns those who offer incentives to athletes. He says said that it hardly provides an authentic basis for national pride if a nation simply buys its athletes. "But I stop my criticism at blaming athletes," Kidd said. "Many of them face great hardships like economic problems, religious and political persecution, and these opportunities could help them make better lives for themselves." Many immigrants come to Canada to escape the hardships Kidd mentions. So it is not surprising that great athletes have also come to this nation. "In a country of immigrants, immigrants have contributed enormously to the development of sports, and have represented Canada year in and year out," Kidd said. One such immigrant athlete is Dusan Lazarevic, 24. He started playing water polo with a local club in his hometown of Belgrade at the early age of six. In 1994, his family moved to Canada to find a better life, away from the civil war taking place throughout Yugoslavia. Within weeks of arriving in Toronto, Lazarevic found the York Mavericks Water Polo team, where he has excelled in water polo ever since. In 1998, the national team selected Lazarevic to play for Canada. But before he was eligible to join the team, Lazarevic needed Canadian citizenship. Lazarevic said the national team helped him get citizenship two years faster than his parents got their Canadian passports. George Gross, an Olympian and former Canadian national team coach of men's water polo, strongly advocates that immigrant athletes playing for Canada's national teams deserve citizenship faster than the average immigrant. "An athletes' window of opportunity to play is limited and may only be one Olympics," Gross said. "The biggest contribution an athlete can bring to a country is international exposure and success, which most governments view as positive! If Canada held immigrant athletes to the normal rule and it went past an athletes' window of opportunity, then in affect Canada does not get part of its citizens' contribution." Thomas Jones, Chief Executive Officer of Athletes CAN, an advocacy group for Canadian athletes, said athletes deserve special rights, as given to other immigrating groups. "Athletes should have every much the right as business people with vast amounts of money or scientists do to get the immigration process sped up," Jones said. "Because athletes contribute to the country directly through their natural talents." When selecting athletes for a team, Jones said it comes down to talent and the ability of the athlete to perform well. "It's not fair to say that simply if you are a new Canadian citizen you would not be in the same boat as everyone else when getting selected for a team," Jones said. Gross said that his attitude when selecting the last members of a team, between a born Canadian and an athlete who has parachuted in, he would pick the Canadian athlete. "If there is little to no difference in talent, the Canadian has contributed to our athletic system throughout the years coming through the system, where the parachuted athlete has not." But in the end Gross said if there is a large degree of talent differential, his choice would be to drop the last Canadian off the roster to put the new Canadian on the team. But selecting foreign athletes above Canadian-born athletes leads to the question about double loyalties. The starting centre forward for team Canada, Lazarevic said no one has ever questioned his loyalty to Canada but in 1999 his loyalty to Serbia came into conflict with playing for Canada. In March of 1999, NATO started a bombing campaign in Kosovo to stop the ethnic cleansing of Albanian Muslims by Serbians. Being born of Serbian origin, Lazarevic was angered by Canada's involvement in this campaign and boycotted the Canadian national team at the French Open Water Polo tournament. "I was trying to make a statement," Lazarevic said. "It's hard to represent a country that is bombing the country where I am from." Kidd said it is inevitable that people carry bitter debates over identity, foreign policy and military intervention into sport. During his athletic career, Kidd was a leading supporter of the boycott against the apartheid South African team in the Olympics and spoke out against America's boycott of the Moscow Olympics during the Cold War. "I think one of the features of Canadian society is that we understand that people have multiple loyalties and identities," Kidd said. "It's anyone's right in a liberal democratic society to be critical of a foreign policy, and we should respect that as long as one does it in a liberal democratic frame." But Gross has a problem with the idea of double loyalties of foreign-born athletes. "You are either a Canadian or you are not, this is not a rent-a-country" Gross said. "My parents came here from Hungary and Czechoslovakia to be Canadian. Anytime Canada plays Hungary or Czechoslovakia, there is no question who my parents cheer for: it's Canada. This is how all new Canadians should act." Coaching the 1988 Canadian track team at the Olympics, Georgevski was upset at the way a few Canadian newspapers portrayed Jamaican-born Ben Johnson's disgrace. Georgevski said when Johnson set the new record, the media made him out to be Canada's hero. But when the scandal over Johnson's use of performance-enhancing drugs occurred, a few select papers emphasized Johnson's Jamaican heritage.
" Ben Johnson did a lot of things wrong," Georgevski said. "But we welcomed him to the country, we helped him all the way through and built him up. Let us not disown him, he is one of ours. He is not the disgraced Jamaican runner, he is the disgraced Canadian runner." Looking past Johnson's disgrace to the 2004 Olympics in Athens, Team Canada needed any hope that was available. Team Canada only managed to come away with 12 medals, compared to the United States' 103. Is importing athletes Canada's solution to Olympic glory? "Being an elite athlete should be a by-product of the grassroots and intermediate sports systems we have in place in this country and not through indirect benefit," Georgevski said. According to Lazarevic, we cannot buy our places on the podium. He said foreign-born athletes bring new systems, new skills, and different approaches to the game, which helps but is not a full solution. "If good foreign athletes come, they give competition for spots on the team to Canadian athletes," Lazarevic said. "Then Canadian-born athletes will work harder for spots on the team." Coming to Canada for a better life seems to be enough incentive for many talented foreign-born athletes to represent Canada in the Olympics and on national teams. Gross, Lazerevic, Georgevski and Kidd all said money will help Canada's performance in the Olympics but not by buying talented athletes from other countries. These Canadian coaches and players said Canada should spend more on athletics in schools and in club teams, so that all Canadians, no matter what cultural background, have a chance to play sports. This will expand the pool of athletes national teams can select from, give more competition for Canadian teams, but more importantly it will help Canadians become more active and healthier, the goal of all sports. If you pass by U of T's 50m, Olympic size swimming pool during the week, you may overhear the Blues men's water polo team yelling out reps in French, Mandarin, Hindi, Japanese and Serbian. The sport-a combination of swimming, football and volleyball-has an international past. It first popped up in the global sports scene when it became the first team sport added to the Olympics in 1900. Founded in Scotland two decades earlier, rudimentary water polo was played with very crude rules and lead to many fatal injuries. 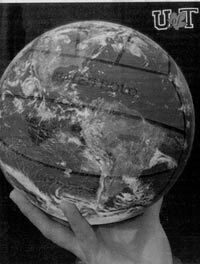 It later flourished in Cold War Europe, where Eastern European countries in particular excelled at the game. Now, in the era of globalization, the Blues men's team is a reflection of water polo's eclectic past. "This team [of 2003] is the most culturally diverse since water polo first came to U of T in the early 1900's," said Blues South African manager Quentin Stossel. Much like the various elements of the human body, this year's diverse men's water polo team is stitched together to create one whole. The legs of the cultural quilt consists of two parts-an ex-Singapore junior national team member, and a first-generation Jewish-Indian goalie. The goaltender has both competed in the Maccabiah Jewish games in Israel, and played for Maharashtra Western Railways team in Mumbai, India. The team's guts come from the left-side drivers: an "Italian Stallion" exchange student from Italy, and a medical student from Kitchener, Ont. whose zinging shot helped win the OUA championship last year. The team's brute arms are built up with a Macedonian junior national champion, a pair of Canadian national champs, and a Hungarian-Canadian captain. The team's heart is pumped from the diverse and deep bench of players hailing from Quebec, Italy, Vietnam, China, Iran, and Canada. Finally, the team's brain and nerves are networked through the head coach, Som Seif, who is Persian. The Varsity Blues have started the season off well, beating York last night 10-4. Rookie Jake Pottier led the Blues in scoring with five goals. It remains to be seen if they can defeat Queen's when they hit the road this Saturday, Oct. 4. The Israeli and Palestinian boys were understandably bummed about their Dallas Cup debut, a humbling 9-0 loss. But administrators for this uncommon mix of children, dubbed the Peace Team, understand the trip is hardly about soccer results. It's about Mohammad Amin Halaaf - and 17 boys like him assembled just for this weeklong visit. Not so long ago, seeds of hate were budding in this 12-year-old Palestinian. Peace Team officials feared radical ideas were already spinning beneath his Beatlesque mop of straight black hair. The Peace Team's real aim during the prestigious youth soccer tournament is to nip such potentially extremist thinking. They want the Israeli and Palestinian children integrating culturally. They want them "dealing with each other in sports, not thinking about carrying bombs or worrying about getting killed on a bus," program director Alon Beer said. The project, organized by the Peres Center for Peace in Tel Aviv, has combined nine Israeli boys and nine Palestinian boys from the West Bank. The children, ages 10-12, would have no interaction with the other side if not for such initiatives. Halaaf is from the city of Isawiya inside Israel. He once watched his father jailed and, he says, mistreated by Israeli officials. He hated the Israelis for it and was not bashful about wishing harm on the omnipresent soldiers. But Halaaf's views and ideas have softened lately thanks to peaceful time spent with Israeli boys his own age. The team arrived last week, and the closest brush with "conflict" so far has been a spirited group game of rock-paper-scissors. A few other boys argued about their favorite soccer players, which administrators happily tolerated. "I still hate the soldiers," Halaaf says, "but I do not hate anybody on this team. They are my friends now." Alas, that represents progress in that complicated and violent part of the world. Versions of the Peace Team have recently appeared in Norway, Poland and Austria, but this is the organization's first U.S. trip, and the first such excursion for these boys. None of them are naïve. They speak the grown-up language of intifada (the uprising), Qassam missiles, retaliation and normalcy. They all are touched by the violence. Israeli children, like Daniel Cahanov, 11, know people injured or killed by terrorist attacks. A missile recently leveled his school teacher's home, although she was unharmed. The Palestinian children all know someone subjected to harsh treatment by Israeli soldiers. Just a few weeks ago, children on both sides of the conflict had gathered for a soccer tournament organized by the Peres Center. A Qassam missile - a low-tech rocket fired from within the Gaza Strip - landed about 200 yards from the soccer field just minutes before a match. Organizers defiantly pressed on. "They all know about these things because you cannot avoid it," says Beer, the director of sports projects from the Peres Center, founded in 1996 by Nobel Laureate and former Israeli Prime Minister Shimon Peres. Beer says Peace Team administrators are not naïve, either. They have no delusions of eradicating extremist views or reversing a young lifetime of exposure to harmful notions. "We are simply trying to show the boys that, even if it's just a few hours at a time, that living together and working together is practical and possible," Beer said. 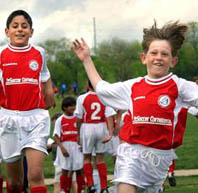 The Peace Team in Dallas was chosen from among 700 youths in the Peres Center's sports programs. They gather twice a week in schools across the country, where Israeli and Palestinian youth mingle in organized activity. These trips are a concentrated version of what they do year-round. The programs are run outside of bustling Tel Aviv. Peace Center officials prefer to reach into disadvantaged areas inside and outside the occupied territories, where views tend to be more extreme. "You can be a kid there and never talk to another boy from the other side," said Shahar Eidelman, who grew up in the United States but now works for the Peres Center in Tel Aviv. "And that leads to all kinds of misconceptions and lack of understanding about the other side." Indeed, Mohammad Mustafa Kashour, 12, from Jerusalem, says he knew only bad things about Israelis before joining the Peace Team. "I heard that they are not good," he said, "that they always make trouble." And yet, just a few seconds later, he asked to be excused from the interview. He was bored, he told the interpreter, and wanted to go play with the other boys, Palestinian and Israeli alike. He rushes over to join his friends, who are kicking soccer balls and discovering the Texas phenomenon of the fire ant. The boys are being housed in pairs by parents from Longhorns Soccer Club. The Israeli boys speak Hebrew; the Palestinian boys speak Arabic. But they have gathered a few words in each other's language. And boys on either side know a smidgen of English. So through a linguistic mish-mash, they seem to have no difficulty understanding one another. Besides, when grown-ups aren't around to tell them what do to - which hasn't been often, as the group has maintained nearly constant motion since it landed - they all speak the universal language of "young boy." Communication is all slapstick and horseplay. And in this case, there are always a few soccer balls around. So hotel lobbies, parking lots and front yards of host families' houses have all been fair game for impromptu bursts of passing, dribbling or ball tricks. Only those who speak Arabic or Hebrew would stand a chance at distinguishing the Palestinian from the Israeli boys. As for the local families which went scrambling for language translation software after learning Friday that their visitors did not speak English - the 11- and 12-year old American boys seem to be better communicators. "My kids are giving me a hard time because I keep doing the hand signals with them," said Jennifer Helm, a Longhorns Soccer Club mom who took a lead role in coordinating the Peace Team's activities. "The [American] boys are just talking to them and, somehow, they all just seem to understand each other." Visa acquisition was rather trouble-free for the Israelis. But not so for the Palestinians, who were subject to more extensive background checks. In fact, the trip remained in some doubt just six hours before the team was scheduled to board its plane for Dallas by way of Frankfurt, Germany. Palestinian coach Alla Aldin Badrieh - the team brought one Israeli and one Palestinian coach - promises more preparation time will make for a stronger team next year. The team was defeated, 6-0, on Monday. "I think we will surprise people," he says assuredly. But Beer isn't worried. He hinted before the tournament that the team might not be serious Dallas Cup contenders. "But they are definitely going to win," he said with a smile, "because in the end, peace will win." The multicultural atmosphere of Toronto has finally brought cricket to the university stage. On Saturday Jan. 17th, the Muslim Students Association (MSA) will hold an inter-university cricket match at Unity Cricket and Sports complex in Mississauga. For those who are still in the dark, cricket is a ball game played between two teams of eleven players. It is played on a large grass oval with a central "pitch." At each end of this pitch are three pieces of wood placed vertically in the ground called the wicket. The game itself is similar to baseball. The wickets act like a back-catcher and the batters job is to protect these wickets with a bat whilst the bowling side try to hit this target with a ball-again similar to a baseball-or else the batter is out. Although baseball has traditionally been Canada's stick and ball game, cricket is finally making a stand in this country. It is estimated that there are 12,000 players within the Canadian Cricket Association, playing in 400 teams on 145 grounds. When the MSA first put on a cricket tournament in October, they had a mere 30 people. Now, just a few months later, the association has grown to 100. "I personally think cricket has always been popular here, especially amongst Canadian immigrants of Pakistani and Indian origin," said Ahmed Badruddin, second-year U of T student and president of the MSA Cricket Board. "There, instead of playing hockey in the streets, kids play cricket." Many cricket enthusiasts in Canada believe that the sport reached their shores during the mid 1700's with British soldiers following the battle at the Plains of Abraham near Quebec City. But it was schoolmaster George A Barber, considered to be the father of Canadian cricket, who spread the sport throughout Toronto during the early 19th century. In 1892, the Canadian Cricket Association was formed. However, the sport's popularity was on the wane as baseball's grew. In the 70s, cricket's popularity began to grow again when Canada played in the World Cup. Then in 2001, Canada played host to the International Cricket Council Trophy tournament. This past year has seen the Canadian team score their biggest victory yet. The team finished third out of 22 countries, to qualify for the 2003 World Cup, where they beat Bangladesh.